Everyone involved in synth driven music , from electronic to rock, from alternative to experimental, was definitely fascinated by the strange early days electronic instruments: the first modular synthetizers. Modulars had their golden age during the late 60’s thru the 70’s with experimental and electronic music and with progressive rock and the first new wave. In the 80’s digital compact synths became the fashion trend and the old analog gear got immediately obsolete. During the 90’s the interest in old analog synths started to grow and Dieter Doepfer was the first who decided that a new analog modular system had to be born again! The new modular standard “Eurorack” was born with Doepfer and a couple more manufacturers at first, but then the eurorack market became full of new brands and ever growing. Today is difficult to know every module in the modular market as it’s full of new units day by day. “I Dream Of Wires” is THE documentary about the modular world, the rise, fall and rebirth of the modular synthetizer! I Dream Of Wires Trailer from Monoduo Films on Vimeo. On Tuesday July 28, I DREAM OF WIRES will celebrate it’s release premiere in Berlin, followed by a live performance by the legendary Morton Subotnick. 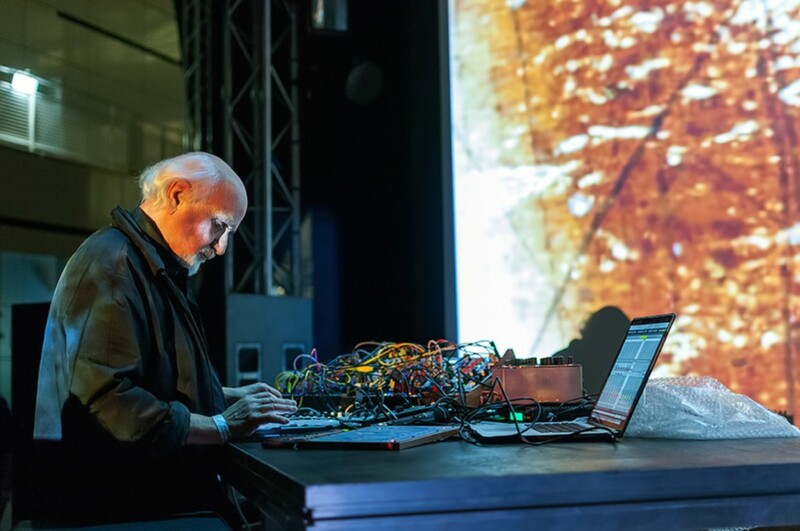 Taking place at Babylon Kino Berlin, Morton Subotnick, accompanied by his frequent collaborator, video artist Lillevan, presents FROM SILVER APPLES OF THE MOON TO A SKY OF CLOUDLESS SULFUR REVISITED: VI, marking Subotnick’s first live appearance in Germany since 2011. Morton Subotnick’s contributions to electronic music cannot be overstated; as a founding member of the seminal San Francisco Tape Music Center, Subotnick played a key role in the conception and development of the influential Buchla modular synthesizer. Armed with his Buchla, Subotnick composed and recorded the landmark 1967 LP, SILVER APPLES OF THE MOON, widely regarded as a modern classic, and the first all-electronic music album to connect with popular music audiences. In 2010 SILVER APPLES was selected for the National Recording Registry of the Library of Congress. Long considered one of the essential milestones in electronic music, it continues to have great effect on later generations of artists. Subotnick’s interview in I DREAM OF WIRES, alongside interviews with influential electronic musicians including Trent Reznor, Gary Numan, Carl Craig, James Holden and Vince Clarke, is pivotal in the film, and provides a revealing insight into this true electronic music visionary. The film will be introduced by I DREAM OF WIRES’ director Robert Fantinatto, who will also join Morton Subotnick for a post-screening Q&A. This July 28 event is more than just a celebration of the modular synthesizer; it’s a rare opportunity to learn and experience the historical roots of electronic music. 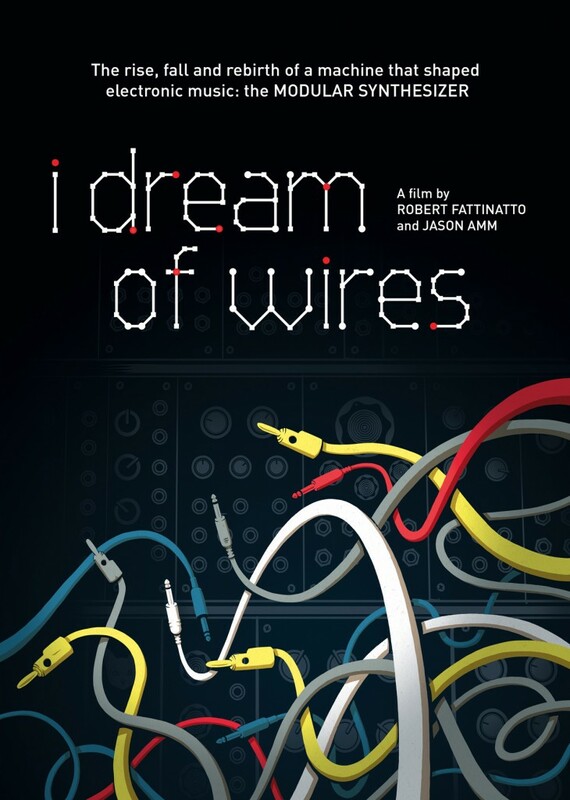 I Dream Of Wires is an independent documentary about the history, demise and resurgence of the modular synthesizer – exploring the dreams and obsessions of people who have dedicated part of their lives to this fascinating, esoteric electronic music machine. Over 100 inventors, musicians and enthusiasts are interviewed about their relationship with the modular synthesizer – for many, it’s an all-consuming passion. Beginning with an historical primer, I Dream Of Wires explores the early development of modular synthesizers in the 1960s, from pioneering companies R.A.Moog Co and Buchla and Associates. We speak to early adopters of the modular synthesizer, forward-thinking musicians like Morton Subotnick, Herb Deutsch, Ramon Sender and Bernie Krause. These musicians offer insight into the modular synthesizer’s conception, providing an outline of Robert Moog‘s “East Coast,” and Don Buchla‘s “West Coast” synthesizer design philosophies, two radically different schools of thought on how musicians would interact with electronic music instruments. The groundwork laid by Moog and Buchla continues to inform the way electronic instruments are designed, and used by musicians, to this day. Legendary and influential electronic musicians and producers like Gary Numan, Chris Carter (Throbbing Gristle), Daniel Miller and Flood discuss the modular synthesizer’s 1970s heyday, through to its near-extinction in the 1980s. From there, we trace the phenomenal resurgence of the modular synthesizer. Established musicians such as Trent Reznor (Nine Inch Nails), Carl Craig, Cevin Key (Skinny Puppy), and Vince Clarke (Erasure) show off their systems and explain why they opt to use this volatile but ultimately rewarding technology. Meanwhile, a new generation of dance and electronica artists including James Holden, Jimmy Edgar, Richard Devine and Clark explain why they’ve stepped away from laptops to embrace the sound and physicality of modular synthesizers. Innovative companies like Modcan, Doepfer, and Synthesis Technology, driven by a desire to revive modular synthesizers, discuss how they planted the seeds that have now grown into a major cottage industry, represented by contemporary manufacturers including Make Noise, Intellijel, The Harvestman, Metasonix, and Verbos Electronics. Through tracing the history of the modular synthesizer, I Dream Of Wires also outlines the history of electronic music as a whole, from its very beginnings at the dawn of the electric age. The film provides a fascinating look at how technology has shaped the electronic music landscape; from the giant, “unobtanium” analogue machines of the ’60s, to portable synthesizers and preset digital keyboards… from software synthesizers running on computers and smart-phones, to today’s potpourri of vintage and cutting-edge technologies. Today, the modular synthesizer is no longer an esoteric curiosity or even a mere music instrument – it is an essential tool for radical new sounds and a bona fide subculture. Morton Subotnick is one of the pioneers in the development of electronic music and an innovator in works involving instruments and other media, including interactive computer music systems. The work which brought Subotnick celebrity was Silver Apples of the moon [1966-7], was commissioned by Nonesuch Records, marking the first time an original large-scale composition had been created specifically for the disc medium – a conscious acknowledgment that the home stereo system constituted a present-day form of chamber music. It has become a modern classic and was recently entered into the National Register of Recorded Works at the Library of Congress. Only 300 recordings throughout the entire history of recorded music have been chosen. He is also pioneering works to offer musical creative tools to young children. He is the author of a series of CD-RoMs for children, a children’s website [www.creatingmusic.com] and developing a program for classroom and afgter school programs that will soon become available internationally. He tours extensively throughout the U.S. and Europe as a lecturer and composer/performer. It is sixty years since Pierre Schaeffer started “musique concrète” in Paris. But what is concrete music today? Who are the composers who perform it? A reply to these two questions comes from this musical encounter of Tempo Reale, headed by Daniel Teruggi, composer and Director of Research, INA/GRM, the institution founded by Schaeffer himself. He led the listeners in a journey through the present day and the history of a musical genre which has had no mean influence on contemporary languages. A footage taken by Enrico Cosimi at the Meet The Knobbers – synth meeting in Siena. this is an awesome performance by Dataline on the Elektron Octatrack sampler. Most of the sound come from the OP-1 synth by Teenage Engineering. Here is a cool video that shows the awesome capabilities of the Elektron Machinedrum UW used to make idm and glitch style music. A great part of the job is focused on the control tracks that can play a morph on the instrument traks making the machine change in quite unpredictable way the programmed sounds. IMHO this is one of the BEST video about the ELEKTRON MACHINEDRUM on the net! Really cool drum ‘n’ bass rhythm on the darbuka! Electro harmonix Electric mistress Deluxe vintage flanger and Sequential circuits Prophet 600. Anthony Rother speaks about his music, workflow and set up in his studio.